End of Wanted: Dead or Undead Blog Tour and Giveaway! So so so!! We have reached the end of the Angela Scott Wanted: Dead or Undead bog tour and for the first I've ever hosted I think it's gonna quite good.... Anyone agree?? We'd originally planned for Angela to end the blog tour although she is in Le Paris!! :) and I know we are all hoping she is having a fabulous time! :) If you check our her fb author page Angela has posted up some pics of her time! Right during this tour their has been..... An author interview & author this or that, two book Excerpts, one book spotlight, three giveaways and two guest posts. I know this as a fact that Angela wants to thank every blogger and commenter for taking part and is eternally grateful! (Author Interview & Giveaway) on I Am A Reader, Not A Writer. (Book Spotlight) on We Fancy Books. (Book Exerpt) on Reading Away the Days. (Book Excerpt) & Giveaway on Becky's Barmy Book Blog. 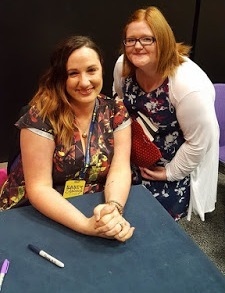 (Guest Post) on Becky's Barmy Book Blog. (Guest Post) & Giveaway on vvb32 reads. (Review) on We Fancy Books. (Character Profile) on Reading Away the Days. Angela has kindly offered an ebook copy of Wanted: Dead or Undead to one lucky commenter! You must be a follower of Reading A Little Bit Of Everything to enter! Angela's books sounds great! I would love a chance to read it! I went back to read the interview on I am a Reader Not a Writer and was interested to find out that Angela wrote the zombie western as the result of a dare from her writer's group. The concept of zombies in the old west is not something that comes up in everyday conversation so I wondered about that!